Background Early life body size and circulating levels of IGF-1 and IGFBP-3 have been linked to increased risks of breast and other cancers, but it is unclear whether these exposures act through a common mechanism. Previous studies have examined the role of IGF-1 and IGFBP-3 genetic variation in relation to adult height and body size, but few studies have examined associations with birthweight and childhood size. Methods We examined whether htSNPs in IGF-1 and the IGFBP-1/IGFBP-3 gene region are associated with the self-reported outcomes of birthweight, body fatness at ages 5 and 10, and body mass index (BMI) at age 18 among healthy women from the Nurses' Health Study (NHS) and NHSII. We used ordinal logistic regression to model odds ratios (ORs) and 95% confidence intervals (CI) of a one category increase for birthweight and somatotypes at ages 5 and 10. We used linear regression to model associations with BMI at age 18. Results Among 4567 healthy women in NHS and NHSII, we observed no association between common IGF-1 or IGFBP-1/IGFBP-3 SNPs and birthweight, body fatness at ages 5 and 10, or BMI at age 18. 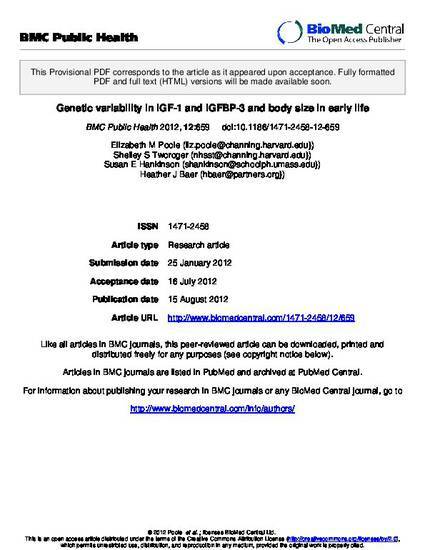 Conclusions Common IGF-1 and IGFBP-1/IGFBP-3 SNPs are not associated with body size in early life.